We are the providers of excellent Rebaring Services, ensuring to attain maximum customers satisfaction with the derived output. We undertakes all type of rebaring work consisting of Column Extension, Structural Connections, Repair Work, Cantilever Connections, and Retaining Wall Applications etc. We are a leading name recognized for taking up various kinds of Civil Contractor jobs. Backed with an expert team of professionals, we provide the most beneficial deals to the clients regarding their Civil Construction Work. Aimed towards providing utmost satisfaction, we provide customized Civil Construction Services to the clients. We, at M/s Vijay I Patel, are engaged in undertaking Civil Construction Projects. We design, construct and maintain civil engineering works. Our plan is prepared according to the requirements of the client as well as according to the budget and space available. Excavation work, Back filling Work and Civil work in Reliance Industries Limited, Jamnagar, Gujarat. A.M. Construction Co. is a Industrial Civil Contractor company, which has experience of executing various steel construction solutions to the industry. We are associated with leading names fortheir Industrial building requirements. Gayatri Construction is a reputed name in Industrial & Civil Construction. 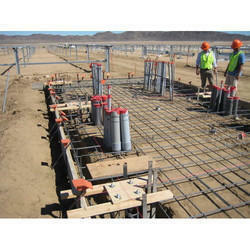 We offer Industrial construction work to match the international standards & quality.